I was looking for a smaller lighter 1911 pistol for concealed carry. 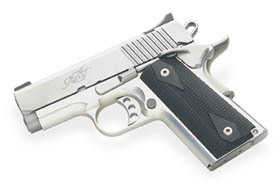 I looked at the Colt Defender, Springfield Compact, and Kimber Ultra Carry in stainless. I selected the Kimber based on all the positive reviews in all the gun magazines. I found that the reviews were both right and wrong. I found the pistol to be very accurate, better than most full size 1911’s out of the box and it shot to point of aim. I had problems with the slide staying back before the magazine was empty and wasn’t sure if this was a slide stop or magazine fault. I purchased two McCormick magazines which I’ve always found to be very reliable. The slide problem continued so I was pretty sure that it was the slide stop. I decided to wait until I had at least 250 rounds through it before complaining. In Nevada you can only list two pistols on your CCW and must qualify with any new make/model you want to add. I shot a perfect score during qualification which again demonstrates the inherent accuracy in the Kimber no bushing barrel design. However, the slide stayed back twice and there was a single instance where the trigger pull had felt extremely light. That night I stripped and cleaned the pistol and all three magazines. I took the pistol to the range the following day to see if I was still having slide stop problems. It was and a new element of excitement was added when the pistol went full auto in three to four round bursts. I was very surprised both by this and the fact that I could keep all the shots on an IPSC target at 15 yards. I fired two more magazines in bursts and then decided that I better not attract too much attention. I sent the pistol back to Kimber with a description of all the faults and to their credit it was returned two days after they got it. I haven’t had any reliability problems with it since. I do now wish it had a selector switch. Based on my experience and the experience of others on Syd’s site, I would recommend that anyone who is considering a Kimber Ultra Carry for concealed carry, fire at least 500 rounds through it and make sure all magazines are well tested before depending on it for your life. If there are any reliability issues, return the pistol to Kimber for repairs.